Yesterday, Ellie Jane fell asleep in the car when we were on our way home after picking up a few things at the store. She had been so fussy, but suddenly, while I was singing to her, I noticed that she had settled and her eyes were closing. I was so happy to simply have a few moments of quiet to breathe and not feel like I was maxed out on multitasking. 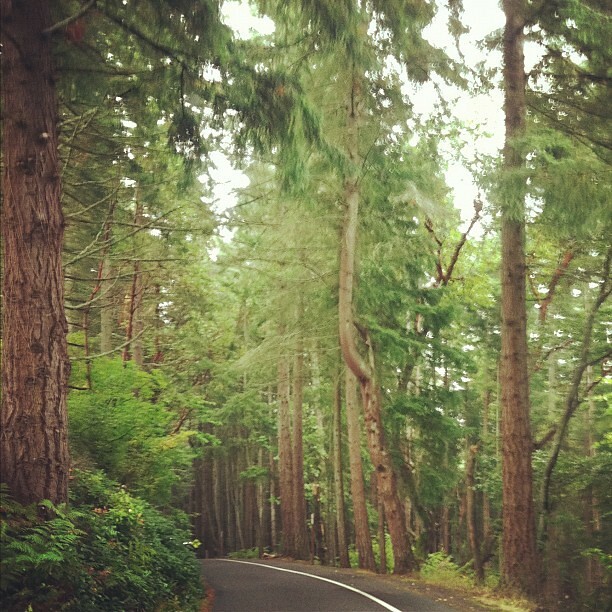 As we got closer to home, I decided to just keep driving and headed toward Point Defiance Park. As John Denver sang about one man finding himself in his twenty-seventh year and a mist of rain fell, I began to notice that autumn really has arrived and the leaves are shedding their green. The pine trees are shedding as well, and the green moss seems to be moving out of the shadows and onto center stage. The park was beautiful. I lowered the windows a bit to invite in the sound of the rain and slowed down to take a few photos with my iphone. Ellie continued sleeping, John Denver kept me company, and I could feel my body begin to relax. My mind was able to slow down enough to just notice one or two thoughts in my usually swirling brain. In the middle of the drive, as I came around a curve in the road, I saw one yellow maple leaf twirl toward the ground. When I say twirl, I mean literally it swirled in a tilt-a-whirl inspired dance right toward the earth. The wonder that came up in me in that moment honestly took my breath away. As a child, maple seeds were often a source of delight as I would pick them up and then watch them helicopter in the air, but I had never seen a maple leaf do this same dance. So it is for the maple tree. So it is for us. And so this is my practice: Creating space in my life to notice the world around and within me. Even in the midst of the multitasking and all that must get done. Even in the midst of the roles I play and the realization that letting go of some need for balance is necessary. My practice: Slowing down, noticing, opening my heart to what I find...to life. And I am reminded over and over again that the first step is to show up as me. And then take a breath. And then another. And trust. If you are seeking ways to be more present to your life...if you are seeking ways to simply begin to recognize that this space for noticing your world and what you need exists in your life...come along with a few other kindred spirits and experience Create Space. We are gathering this weekend and will begin on Monday. Find out more here and please email me with any questions.